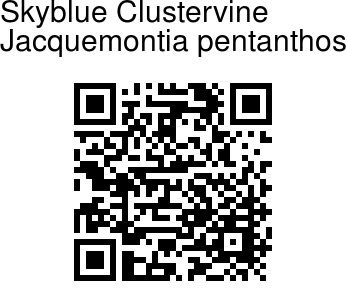 Skyblue Clustervine is a handsome light climber. The stems are herbaceous, velvet-hairy to hairless. Leaves are ovate to broadly ovate, 3-6 cm long, basally heart-shaped, tapering at tip, hairless. Flowers are borne in dense cymes, usually with 1-2 flowers opening at any one time. Sepals are ovate to lanceshaped, pointed to tapering, 4-5 x 2-4 mm, velvet-hairy. Flower mostly blue, sometimes white, 2-2.5 cm across. Fruit is capsular, spherical, brown, hairless. Seeds are brown, 2.5 mm long, hairless. Flowering: June-August. 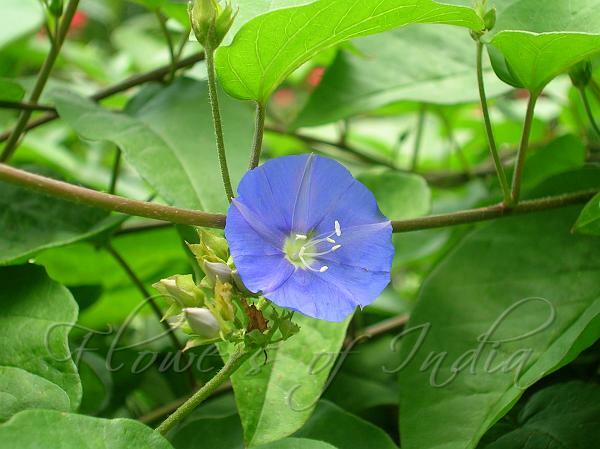 Native to tropical America, it has spread to many tropical countries.